Fujifilm X-H1 is a new camera series and boasts 5-axis image stabilisation built into the camera house. It sports a sturdy and weatherproof case that comes in handy when recording movies in different outdoor settings. Where does Fujifilm X-H1 fit price and feature wise in Fujifilm’s camera line up? It doesn’t replace the X-T2 series, but is rather positioned above this series. The sensor and image processor employed by X-H1 are the same as those found on X-T2 and X-Pro2. There are, however, several major improvements that make this camera attractive to professional photographers. Here’s a breakdown of the most interesting new features and improvements. Fujifilm has taken note that many photographers choose to disable the autofocus. It has therefore added an AF-ON button for quick autofocus switching. Furthermore, it’s quieter than other X-series cameras due to a new mechanism that handles the shutter and it’s also the first model that supports flicker-reduction. The latter implies that the camera is very capable of controlling and optimising light exposure. Image source: Fujifilm. Flicker reduction is a convenient feature when shooting indoors. 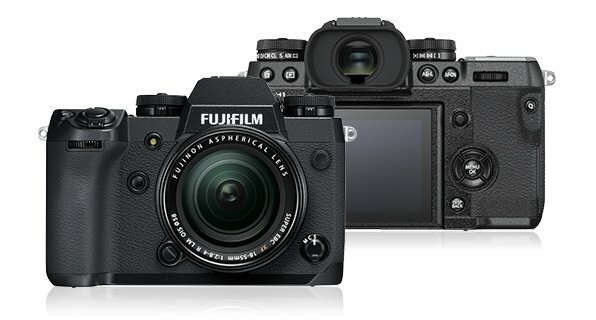 Fujifilm has focused on the recording capabilities of X-H1. It offers the new Eterna profile, which generates “finished video content” straight from the camera. Eterna ensures crisp images under low-light conditions and captures a wide range of nuances. It’s possible to combine Eterna with manual post-shooting color editing. The video quality has been improved due to 200 Mbps recording. In addition, the internal microphone has also experienced improvements. Recording in 1080 format now supports 120 frames per second for slow-motion effects. Moreover, 4K-recording is a given. There are two movie-lenses that work well with X-H1: 50-135 T2,9 and 18-55 T2,9.